The Visual Studio 2010 has just been released, but have apparently been cracked or hacked, thanks to the generic master product key that been used by Microsoft to integrate into pre-activated Visual Studio 2010 Ultimate, Premium and Professional setup installers in ISO image formats, which is been released to MSDN subscribers, and some editions to WebsiteSpark, BizSpark and DreamSpark participants. 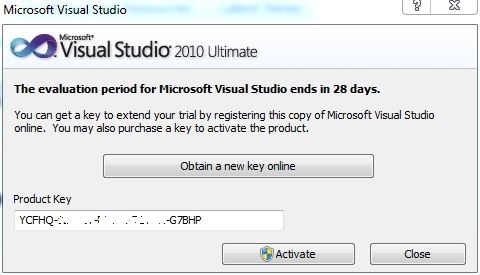 The master static activation product key in question is YCFHQ-9DWCY-*****-*****-*****, which apparently can be used to register, unlock, upgrade, activate and convert all three editions of Visual Studio Professional 2010, Visual Studio Premium 2010 and Visual Studio Ultimate 2010 from trial to full version product. Best of all, Microsoft is providing free official downloads of Visual Studio 2010 trial version, which can be used for free for up to 90 days after registration. The only difference between the trial version and MSDN version (which is identical to ISO been released on *Spark programs) is that the pre-integrated product serial key been removed. As such, the trial version does accept the serial number above to upgrade to full version product. The workaround allows anybody can get free Visual Studio 2010 (which is not the lightweight Visual Studio 2010 Express) from official source without having to rely on warez or torrent sites to download Visual Studio 2010 MSDN ISO images. There are two ways to use the leaked master product key for Visual Studio 2010. 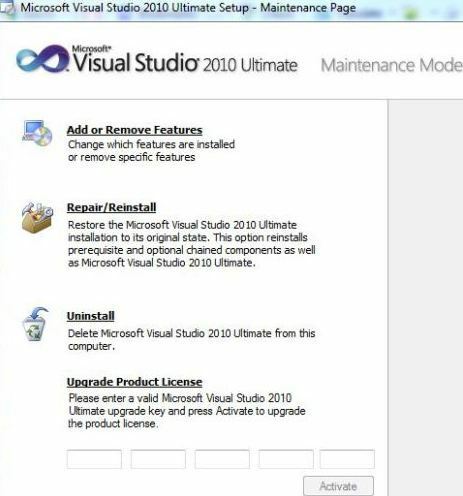 Go to Control Panel -> Programs and Features, locate and highlight Microsoft Visual Studio 2010 Ultimate/Premium/Professional installation, and click on Uninstall/Change button. A Visual Studio setup maintenance screen should be shown. After clicking Next button, an option to enter a valid serial number to upgrade product license is available. Enter the upgrade key accordingly, and click on Activate button. No re-installation required. In any Visual Studio 2010 program, click on Help -> Register Product. Enter the product key and click the Activate button. An error message will appear, stating that the product key cannot be used to extend the product validity. Anyhow, the product key will be accepted, and program will say that a valid product key has been entered after restarting Visual Studio 2010. Unpack the downloaded Visual Studio 2010 Trial ISO with WinRAR, and then modify the setup.sdb under the setup folder with any text editor. Locate the [Product Key] heading, and change the line under it to YCFHQ9DWCY***************. Run the setup.exe to start the installation, which automatically enters the serial key into installed app. Note that other Visual Studio 2010 products uses different master activation product keys, where Visual Studio Team Foundation Server 2010 is P2K4R-VPKVK-*****-*****-*****, while Visual Studio Test Professional 2010 uses DYCF9-QQPCD-*****-*****-*****, and Visual Studio Team Explorer Everywhere 2010 uses 7W3RJ-4WX3R-*****-*****-*****. The leaked product keys potentially costs Microsoft a huge sum, as Visual Studio Ultimate 2010 costs more than $10,000 for a piece of license. Anyway, Visual Studio 2010, been a development and programming tools, may be of less interest to general public. Anyway, Microsoft has been given away free license to use Visual Studio to selected targeted group through various Spark programs to encourage development in Windows environment. Note: Product keys been removed due to Demand for Immediate Take Down – Notice of Infringing Activity – MS Ref. 312243 from Internet1@microsoft-antipiracy.com.